A full moon rises as the winds howl on Mount Everest. Stirred awake by restless, moody winds, I unzipped my tent at 12:30 AM to see a near-full moon gliding toward the ridge to the east. Silence filled the night, until another unrestrained blast of wind could be heard down the narrow walls of the valley. I listened, intently, to its inevitable approach. Someone once told me that Tibetans believe it is the wind that brought life to Earth. And, at that moment, it seemed plausible that the wind was blowing life into the silhouetted rock spires that stand like people on the ridges above our camp, waiting for the wind to turn them from stone to flesh. The elements here are raw and primal: earth, water, sky, and fire are all we have. There is no interruption of green trees, or violet flowers, just the gray and brown of the glacial debris, the white ice of frozen water, the deep azure of the sky, and the roar of our kerosene stoves in the early morning light. It would be only a few hours before our Sherpas would leave the North Col for another carry of oxygen and camp supplies to Camp V. Now there is little holding our climbers back from going higher—little but the wind. Today the team moves up from Advance Base Camp to the North Col. "Knock on wood, we'll find a couple of good days here to start our search out of Camp V," said Eric Simonson from Advance Base Camp on the noon radio call. He and Dave Hahn were about to l eave camp on the heels of our five other climbers: Conrad Anker, Andy Politz, Tap Richards, Jake Norton, and Thom Pollard. Today's Kodak digital camera (L) with the Kodak Vestpocket camera of the 1920s (R). Pollard, sheepish at having to admit it, came on the radio earlier to explain that the Kodak digital still camera had slipped from his hands, slid briefly across the ice, and fallen into a crevasse. It could've happened to anyone, but for Pollard it was especially frustrating, knowing as he did the efforts NOVA had taken to send up this new "backup" camera with a group of trekkers a few weeks before. I couldn't help but think that it was a strange stroke of fate, one digital Kodak camera slides into a crevasse as we're searching for its predecessor, a 1924 Kodak Vestpocket camera lying 5,000 feet higher on the icy slopes of Everest. ".....that was a bad moment, its memory is still fresh. The wind, even at this early hour, took our breath away like a plunge into the icy waters of a mountain lake, and in a minute or two our well-protected hands lost all sensation as they grasped the frozen rocks to steady us." At Base Camp, we continue our filming, in preparation for the search attempt, which we will film with long lenses from our vantage point. Today Jochen Hemmleb found a boulder in the shadow of Everest that has the same profile as the mountain, with three humps for the three famous "Steps" on Everest and a distinctive pyramidal summit. 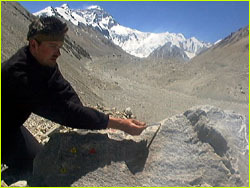 For the documentary, Hemmleb was able to show us in graphic terms—using the boulder as a stand-in for Everest—the route up the mountain to Camp V, the search area for the body near the Chinese Camp VI, the location of where the ice axe was found in 1933, and the route past the First, Second, and Third Steps to the summit. Jochen Hemmleb points to the "steps" of Everest on a make-shift model. With every step that the team moves higher on the mountain, we go over our maps and re-read the few accounts of the 1975 sighting of a body near the Chinese Camp VI. Hemmleb is "convinced" the body is there and has given the climbers a laminated Research Manual to locate the exact site of the Chinese Camp VI. Simonson, who has a handheld GPS, will input the exact coordinates of the site, to aid them as they approach the old camp. From there the team members will fan out, heading west in their search for what Hemmleb believes is the body of Andrew Irvine. The 6:00 PM radio call brings good news. Pete Athans, on the south side of Everest, breaks into our regularly scheduled call to send his regards from Advance Base Camp in the Western Cwm. It is remarkable to me that we can speak with climbers on the opposite side of Everest. 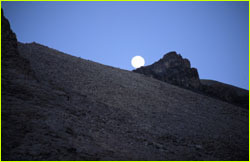 Athans informs us his team will make its summit attempt on the third or fourth of May. As for Athans, if he's successful, he will stand on the summit of Everest for a sixth time, the most for any non-Sherpa. Meanwhile everyone on our team is feeling strong and ready to move up and occupy Camp V. "This is our sixth time up here to the North Col," Pollard reminds us, "so we're feeling pretty good." Photos: (1,4) Liesl Clark; (2) Kodak; (3) Peace River Studios.